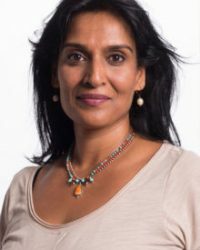 Executive Director of the Amrit Yoga Institute, Yogeshwari Over the last 20 years, internationally known Kamini Desai, PhD. has created an exciting and versatile body of teaching, combining western psychology and eastern philosophy. Kamini’s experiential teaching style has been welcomed in over 10 countries around the world. Her proven system of Professional Energy Management has benefitted employees at Sony, KPN Telecom, Mars Confectionery and in the Netherlands government. She is developer of core curriculum of the Amrit Yoga Institute and currently serves as Director and Lead Teacher of the Amrit Method of Yoga Teacher Trainings Level I and Level II as well as the Amrit Method of Yoga Nidra Professional Training with Gurudev. Author of Yoga Nidra: The Art of Transformational Sleep and Life Lessons, Love Lessons.